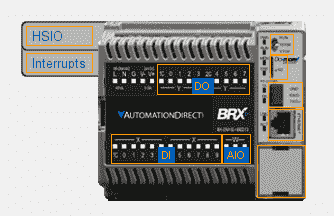 The BRX PLC like all of the PLCs in the Do-More Series use strong data typing. This means that there are fixed memory structures to work with in your program. Errors will be displayed if you try to put the wrong type of value in the memory location. The data structures will automatically assist you in your automation system. Memory can now be as flexible as you want and need. 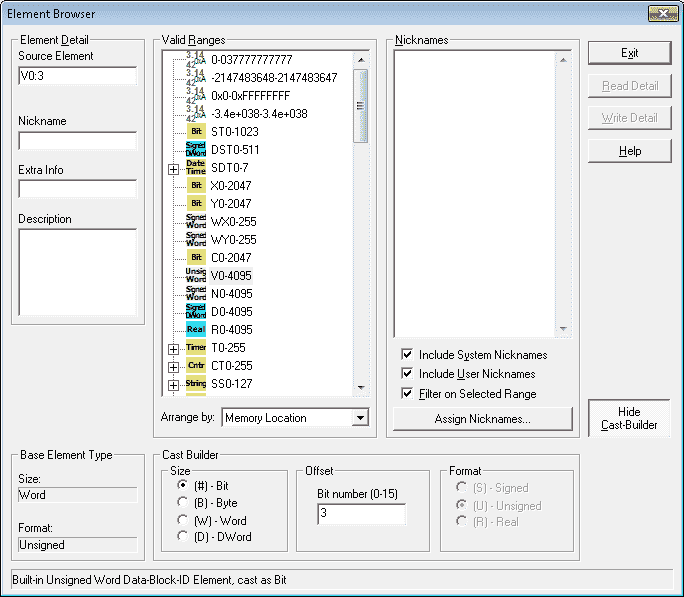 You can define and allocate all the data memory the way you want it up to specific maximums. As a system integrator you determine what best fits your automation framework. 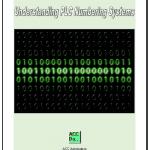 We will be looking at the addressing and numbering systems in the BRX Series PLC. Let’s get started. 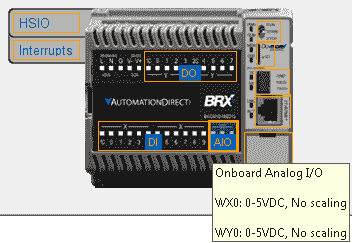 When we go online to our BRX PLC or develop a new project and select the controller, the dashboard will show us a picture of our controller. When we highlight the DI (Discrete Inputs) you will see the input number, address and filter value. 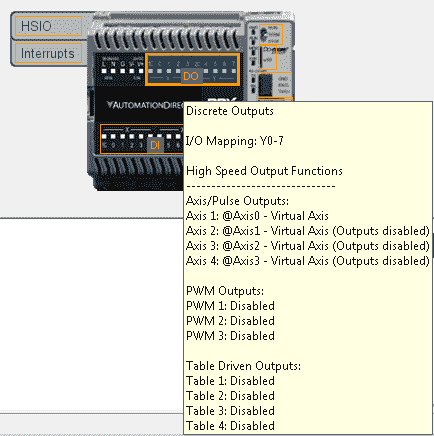 Highlight the AIO (Analog Input/Output) and it will show you the addressing for the analog signals. Another way to view the I/O addresses is to use the system configuration window. 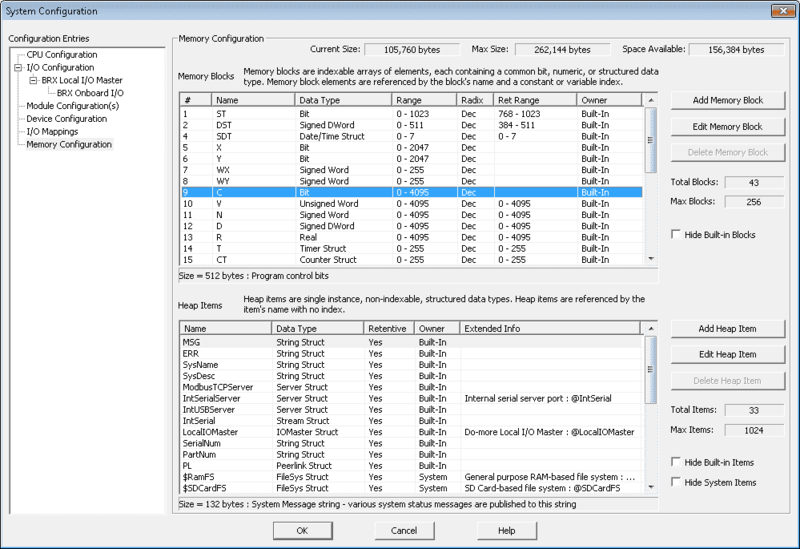 Here you can display the addresses and change the features of the I/O such as filters, Interrupts and High Speed I/O. As mentioned before the BRX PLC uses strong data typing. These are called Data Blocks in the Do-More Controller. We have a number of built-in data blocks that are pre-configured, but we may change through the memory configuration window. The following tables will give an overview of the data block areas. ST Bit ST0 – ST1023 System Assigned Bits – Clock Flags etc. DST DWord DST0-DST511 System Assigned DWords – Scan Times etc. In the BRX Do-More Controller there are three types of casting. Extraction casts will isolate a bit, byte or word from a larger element. Aggregation casts will group multiple elements into a larger element. Format casts will reinterpret the format of data in the element. The Do-More Designer software has a built-in cast builder that will help you in casing different elements. This is done by the Element Browser window. You can get to the Element Browser window by the main menu. Search | Element Browser… The short cut key is F9. Hit the Show Cast-Builder button to show the cast builder. Let’s select the source element as V0. The picture above will automatically show you that V0 is a unsigned word. 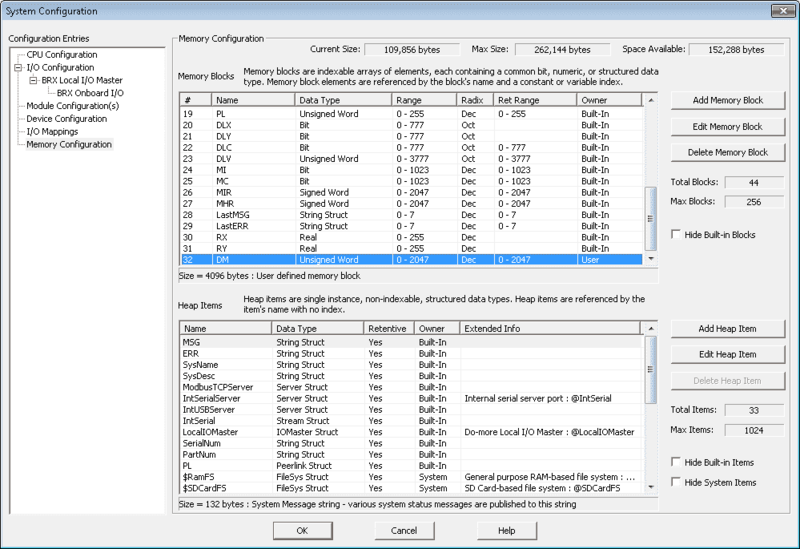 We will now select under the cast builder size (#) – Bit and under the offset 3. This means that we want the third bit in V0. The result V0:3 specify the bit that we are looking for in the word. Now let’s take the same word and cast it as a DWord Real value. This means that our instruction will use V0 and V1. Our resulting cast is V0:RD. Indirect addressing allows the memory addressed used by an instruction to be varied so that it can point to more than one location when running. All of the data blocks in the CPU can be used as arrays. This includes the ones that you can define yourself. The array index must be in the range of 0 to 65535 and must be stored in the V memory location. In this example we are using V0 as the pointer in the array. Its value ranges from 1 to 6. We are using the instruction Move V[V0] to V100. 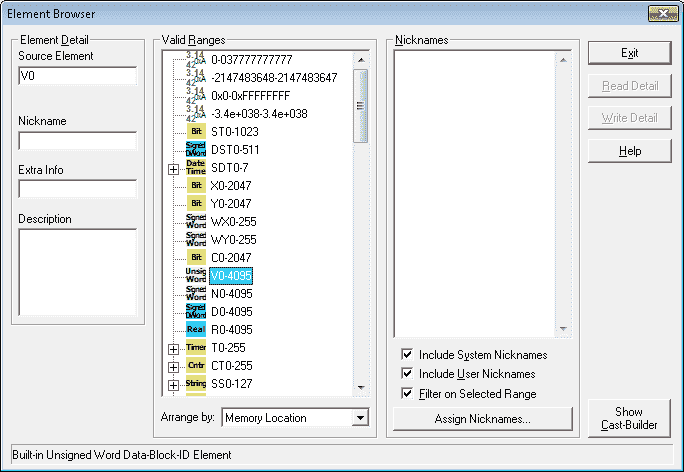 Creating and modifying data blocks can be accomplished by the system configuration window. 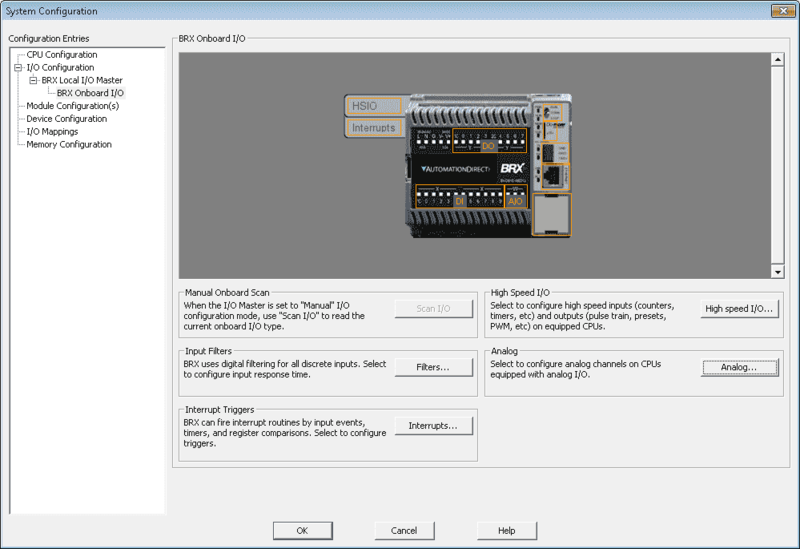 Main menu PLC | System Configuration… You can also hit the Configure symbol on the toolbar. Lets edit the C block of memory. 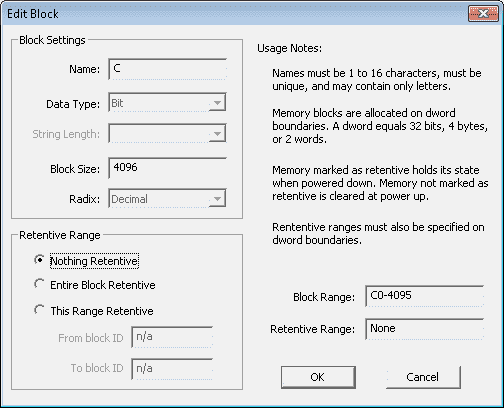 Double click on the C block (#9) or click and select Edit Memory Block. You can see the parameters for this block of memory. Lets change the size of the block to 4095 and make them non-memory retentive. Once the parameters are changed select OK to save your configuration. Our modification of our memory block is complete. To create a new memory block in our BRX controller, select the Add Memory Block button on the system configuration window. We can now put in the parameters that we want for our new memory block. 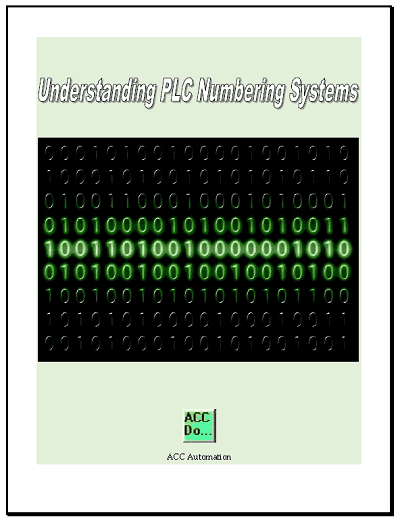 Entire Block Retentive – When power is removed from the PLC or the mode of the PLC changes from Run to Program, the information is retained. 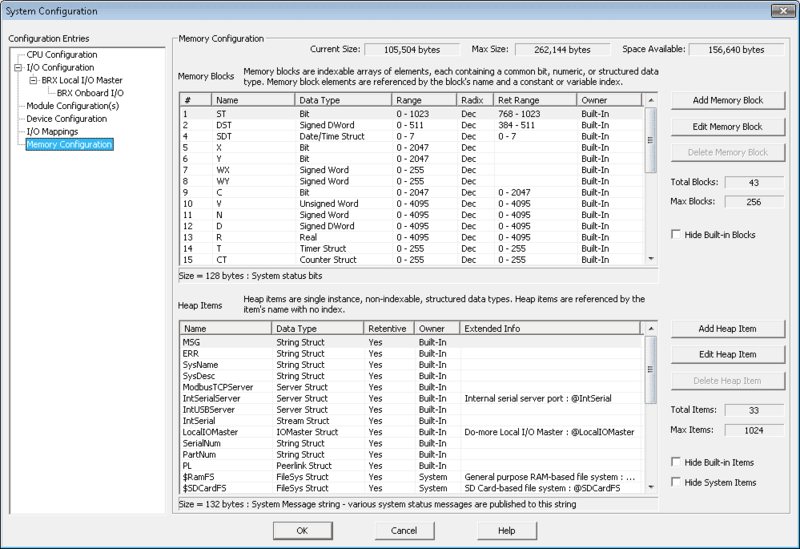 We can now see our new block on the system configuration window. 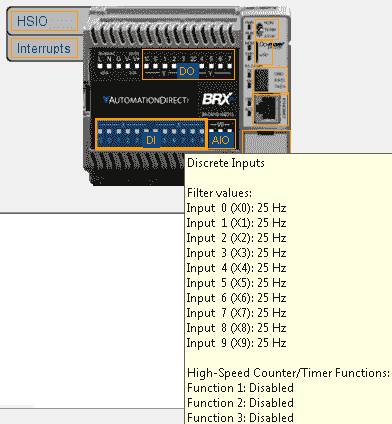 Changing and adding memory blocks is a great feature on this new BRX series PLC. You can watch the video below to see the different numbering systems and addressing on the BRX Series PLC. Next time we will look at our first program using the BRX PLC.